Ptolemy XII Neos Dionysos Theos Philopator Theos Philadelphos (Greek:Πτολεμαίος Νέος Διόνυσος Θέος Φιλοπάτωρ Θεός Φιλάδελφος,New Dionysus, God Beloved of his Father, God Beloved of his Brother) (117 BC - 51 BC) was son of Ptolemy IX Soter II. His mother is unknown. He was king of Egypt from 80 BC to 58 BC and from 55 BC until his death in 51 BC. In 80 BC, Ptolemy XII succeeded Ptolemy XI Alexandros II to the throne of Egypt. The latter had been lynched by an angry crowd, after he had killed his popular coregent Berenice III, who was incidentally also a daughter of Ptolemy IX Soter II. When Ptolemy XI died without a male heir, the only available male descendents of the Ptolemy I lineage were the illegitimate sons of Ptolemy IX by an unknown Alexandrian Greek concubine (Clayton, 1994). The boys were living in exile in Sinope, at the court of Mithridates VI, King of Pontus. The eldest of the boys was proclaimed king as Ptolemy XII Neos Dionysos and married his sister, Tryphaena. At first, Ptolemy XII was coregent with his daughter Cleopatra VI Tryphaina and his wife Cleopatra V Tryphaena, but the former mysteriously disappears from the records in 69 BC. Now all at kings after the third Ptolemy, being corrupted by luxurious living, have administered the affairs of government badly, but worst of all the fourth, seventh, and the last, Auletes, who, apart from his general licentiousness, practised the accompaniment of choruses with the flute, and upon this he prided himself so much that he would not hesitate to celebrate contests in the royal palace, and at these contests would come forward to vie with the opposing contestants. During his reign, Ptolemy XII tried to secure his own fate and the fate of his dynasty by means of a pro-Roman policy. At the height of his success in 59 BC, after paying substantial bribes to Julius Caesar and Pompey, a formal alliance was formed (foedera) and his name was inscribed into the list of friends and allies of the people of Rome (amici et socii populi Romani). However in 58 BC after he failed to comment on the Roman conquest of Cyprus, a territory ruled by his brother, he was forced to flee to Rome. His daughter Berenice IV became his successor. From Rome he prosecuted his restitution. He was finally brought back into office with help of the Romans in 55 BC. From then on he reigned until he fell ill in 51 BC. Soon before his death he chose his daughter Cleopatra VII as his coregent. In his will he declared that she and her brother Ptolemy XIII should rule the kingdom together. To safeguard his interests, he made the people of Rome executors of his will. Auletes means pipes-player, and refers to his chubby cheeks (a Ptolemaic family trait ), like the inflated cheeks of a pipe-player. 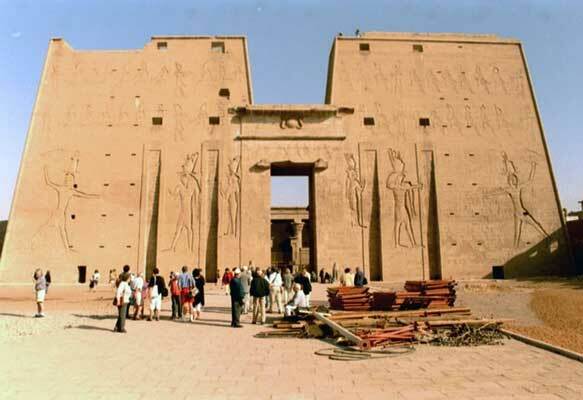 The first pylon at Edfu Temple was decorated by Ptolemy XII in 57 BC with figures of himself smiting the enemy ( Photo: Harm Frielink). "Numbering the Ptolemies is a modern invention; the Greeks distinguished them by nickname. The number given here is the present consensus; but there has been some disagreement about which Ptolemies should be counted as reigning. Older sources may give a number one higher or lower, but the same epithet. " Clayton, A. (1994) "Chronicle of the Pharaohs: The Reign by Reign Record of the Rulers and Dynasties of Ancient Egypt." London: Thames and Hudson. ISBN 0-500-05074-0.